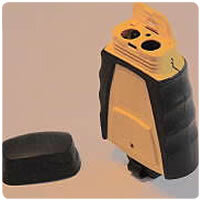 Industrial Sector Parts - Protoplast Inc.Protoplast Inc.
PPI, working with a customer, was asked to produce this finished product; a Global Positioning System handheld navigation device. Working with the design demands: lightness, comfort and aesthetics, the finished item passed muster. However some of the technical challenges deserve to be explained. 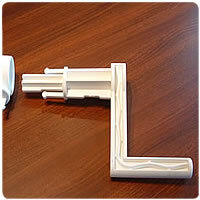 Firstly the molded case needed soft grips, an overmolding challenge. Secondly, the cap had to be a precise fit and ‘click’ into a secure and weatherproof position, a molding design challenge. Finally, the sub-assembly work had to be completed in a timely and cost efficient way. PPI was asked to produce this finished product: a Swimming Pool Cover/Blanket Roller. This device has three parts, the roller handle actuator, the main housing and the end-piece. All parts were molded in the same mold in three cavities. The pieces were trimmed at the press and then sent for packaging in the sub-assembly department. 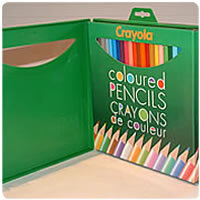 PPI was approached by the leading manufacturer of Crayons and asked to fabricate a one-piece plastic case that would hold the kits of crayons. Molded in one mold, trimmed and then sent to packaging in the subassembly department, PPI produced the part; ready for final shipping to the wholesalers. PPI demonstrates its versatility with this product. The Caribou of the North are migratory and one of the ways that the habits and health of each animal can be tracked is by a neckband. 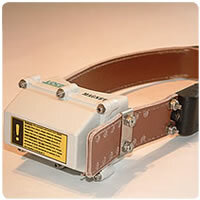 This extra-strength leather collar has two assemblies mounted on it, both manufactured by PPI. The bigger assembly (the one that hangs under the animal’s chin) holds the navigational tracking system (NTS) and the smaller one, attached to the collar strap, emits a harmless charge which gently detaches the unit from the animals neck, eliminating a second capture and further stress to the animal.